This chapter considers issues and possibilities for connecting the writing students are doing in digital environments outside of school to developing writing ability within school. It presents theoretical frameworks consistent with exploring that connection, including New Literacy Studies and participatory culture. 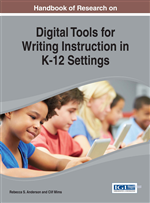 The authors offer a rationale for linking in and out-of-school literacies and give specific examples of the types of writing that connect these two cultures with digital writing tools. Finally, the chapter discusses implications for teaching. There is a fundamental tension in the teaching of writing between what is standard and what is individual (Kress, 2003). On one hand, teachers guide students to engage in conventional writing that follows specific rules and formats. However, writing is also a means of individual expression, highly creative and situated in the context of the learner (Gee, 2007). That dichotomy is reflected prominently today in students’ in-school and out-of-school literacies, which is the topic we address in this chapter. In an information age texts are ubiquitous in and out of school, appearing in a mélange of media, formats, and contexts that include conventional printed materials in school and a variety of electronic devices often more common outside of school. In the contemporary world, new digital forms of writing permeate a broad swath of students’ lives outside of school, and these new forms have little resemblance to the conventional writing that remains entrenched within many schools. Consequently, digital forms of communication and writing may not be recognized, validated, or integrated productively into formal writing instruction. In fact, a 2008 study of students’ in- and out-of-school writing practices revealed that, although all teens write for school and 93% write for their own pleasure, 60% do not consider their electronic communication as writing (Lenhart, Arafeh, Smith, & Macgill, 2008). Further, 49% reported enjoying the writing they do outside of school, whereas only 17% liked the writing they do in school (Lenhart et al., 2008). Why do students not identify their more informal, digital communication as writing? What implications does that disjuncture have on students’ self-efficacy and motivation to write? How can in-school writing connect to the enjoyment students’ have in out-of-school writing? These are the questions we address in this chapter. The value students find in writing for themselves outside of school, often today in digital spaces, has important implications for the teaching of writing within schools as well as the skills needed for students to thrive in the 21st century. Because writing with digital tools is part of the culture in which students live outside of school, we begin with a discussion using New Literacy Studies (NLS) to examine how this context is tied to literacy (Gee, 2011), and how that culture has become more participatory (Jenkins, Clinton, Purushotma, Robison, & Weigal, 2006). The essence of the latter perspective is that contemporary writing means blurring the boundaries between students and their teacher as mentors and between formal and informal writing with an emphasis on creativity that makes room for popular culture. Then, we offer a rationale for linking in and out-of-school literacies and give specific examples of the types of writing that connect these two cultures with digital writing tools. Finally, we discuss implications for teaching.